Morning Flight Eagle Throw - 52X68 | BUDK.com - Knives & Swords At The Lowest Prices! 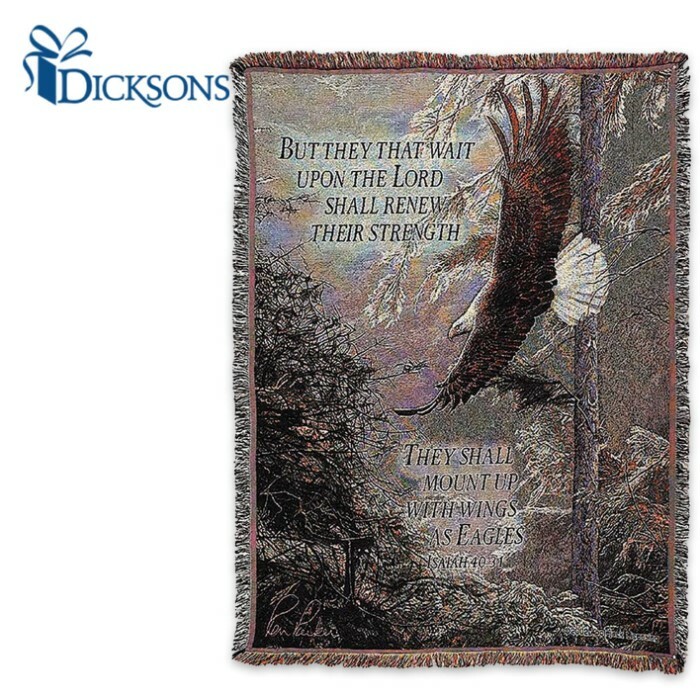 Durable, versatile and exquisitely designed, this stylish Morning Flight Eagle Throw is a great way to show your faith while keeping you warm and/or livening any space in your home, office or elsewhere with alluring rustic charm. The eye-catching, double-layered 100 percent cotton thrown features a meticulously detailed, full-color image of an eagle in flight, flanked by the text of Isaiah 40:31, "But they that wait upon the Lord shall renew their strength. They shall mount up with wings as eagles.” Fringed edges add a smart finishing touch to this lovely piece. At 52" wide x 68" high, the cotton throw is impressively sized and ideally suited to practically any setting. It melds seamlessly into a traditional interior design scheme and even smartly offsets quirky modern and postmodern decor with a touch of rustic grace. Drape it over your couch to showcase and curl under on cold nights. Add vintage appeal to your kitchen or dining area by hanging it on the wall beside the family dining table. Frame it in a reclaimed barnwood frame and showcase it in your office as a prominent, stylish reminder of your Christian faith. There's really no wrong place for this striking cotton throw, and with its timeless design, rest assured it will never go out of fashion. Get two - one for yourself and one to give to a friend and fellow believer. This rustic Morning Flight Eagle Throw makes an outstanding, memorable gift for any occasion, and with our unbeatable prices on fine home decor, it's painless on your wallet, as well!